What’s New: The state of Arizona today announced the formation of the Institute for Automated Mobility to advance the safe deployment of automated vehicles. Intel Corporation is a founding partner of the new institute. This unique public-private consortium will focus on the liability, regulatory and safety implications of automated vehicles and will work to develop standards and best practices for the industry to follow. The group is already working on liability and regulatory research as well as plans for an enclosed 2.1-mile safety test track. Who is Involved: Founding partners include Intel, the Arizona Department of Transportation, the Arizona Department of Public Safety, the Arizona Commerce Authority, Arizona State University, the University of Arizona and Northern Arizona University. Each founding partner has a seat on the board of directors to provide governance, fiduciary oversight and strategic guidance for the institute’s policies and priorities. Founding partners determine research priorities and targeted outcomes and may sponsor ancillary research. The Arizona Commerce Authority will oversee the institute and direct its mission to shape the future of automated transportation science, safety and policy. Academic partners will conduct research and publish papers on important safety-related topics, including liability questions surrounding automated vehicles involved in accidents, compensation models and safety standards. Intel will work with all partners offering Mobileye’s Responsibility Sensitive Safety (RSS) model as a starting point for building their solutions. RSS is already deployed by Baidu* in its Project Apollo and Apollo Pilot Programs for Automated Driving. The Arizona Department of Public Safety and Arizona Department of Transportation will build a traffic incident management center to integrate law enforcement and first responders with automated technologies unlike any other location in the country. Why It Matters: Automated vehicles will transform the world as we know it. 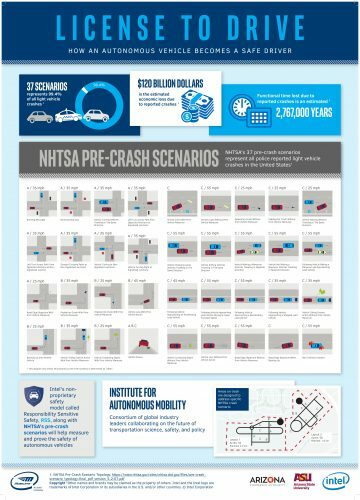 According to the National Highway Traffic Safety Administration, traffic crashes in the U.S. claim more than 35,000 lives and cost more than $252 billion each year. What’s more, 94 percent of serious crashes are caused by human error. Automated vehicles can remove humans from the driving scenario1. A market opportunity and societal disruption of this size demands validated safety and security standards that don’t yet exist. What is RSS: Mobileye CEO Professor Amnon Shashua first proposed RSS in 2017 as an open, transparent and technology-neutral starting point for the industry to align on what it means for an autonomous vehicle to drive safely. To put it simply: While planning gets you from point A to point B, RSS helps keep you safe along the way. RSS formalizes human notions of safe driving into a verifiable model with logically provable rules and defines appropriate responses. Additionally, RSS ensures that only safe decisions are made by the automated vehicle and that the automated vehicle will do everything it can to avoid being involved in unsafe situations initiated by others.